Puffing, panting and sweating. 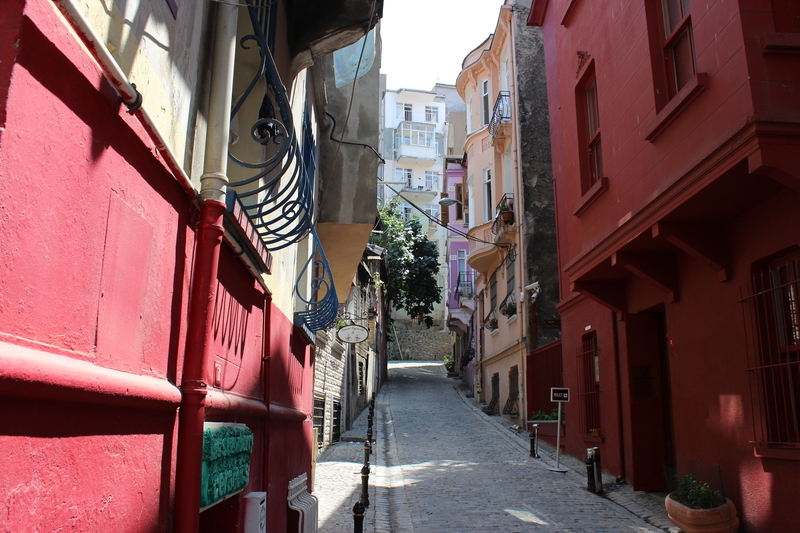 This was the first memories I have of Istanbul as I adventurously walked up the hilly and winding streets of Beyoglu, a somewhat quiet neighborhood that seems to wake up only after breakfast-time. I dreaded taking long-haul flights so after a 10-hour sit-fest from Kuala Lumpur, a trek along the shores of the Bosphorus and a hike up to Taksim Square provides a welcome relief for my numbing legs and behind. This was my first time in the great city of Istanbul, where I spent a full summer’s week at the crossroads of Europe and Asia. I began the day with a hearty brunch of lamb and rice, both cooked to fluffy perfection, before taking the crowded tram to Tophane on the other side of the Golden Horn. My first stop was the Istanbul Modern, a recently opened contemporary art museum birthed from the demise of a shipping warehouse. 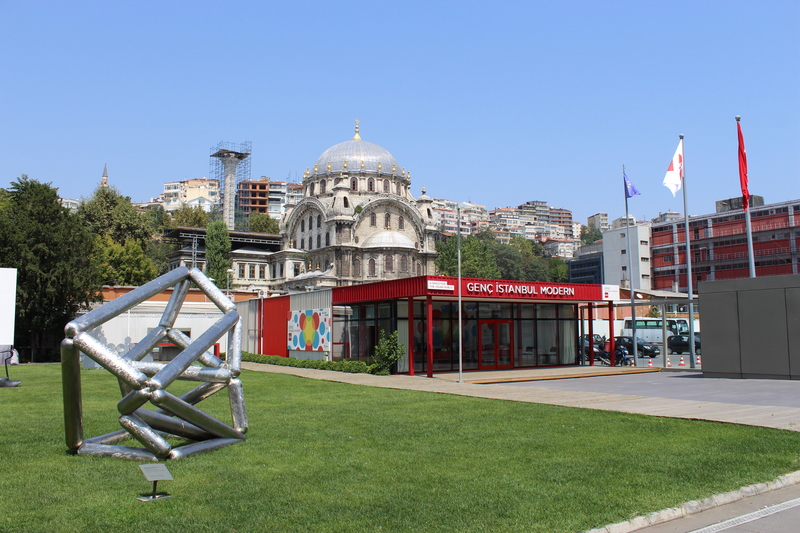 Giant metallic sculptures adorn the grounds of the museum while the exhibitions inside are mutually impressive – expressionist and postmodern art occupied the top floor while photography works were displayed along a long corridor at the ground floor. A breath of fresh air in an ancient city. I was attracted to the photography collection because pictures have a more realistic way of telling me a story than a painting or sculpture – it’s a good way to gain a bit of an insight into the lives of Turks and how they see the world through their lenses. After a solid one hour at the museum, I dragged myself along the cobbled brick roads going uphill to the infamous Taksim Square, taking the time to observe the goings-on of the people of Beyoglu and take in the architecture of the neighborhood which was new to me back then. The tiny cobbled streets of Beyoglu. The near-claustrophobic streets finally opened up to the vast expanse of Taksim Square with its centerpiece “Monument of the Republic” proudly gleaming around hordes of camera trigger-happy tourists and locals on their lunch break. 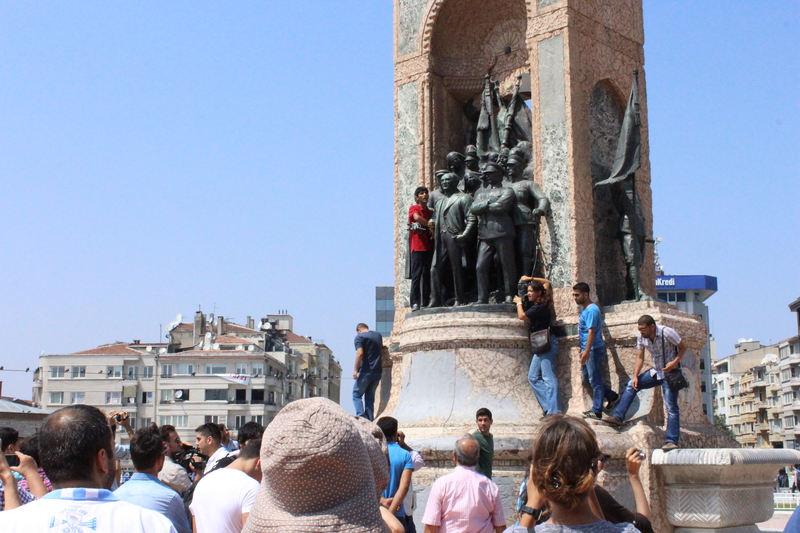 Before I can take a breather, a bunch of protestors climbed the monument and started shouting about the corrupt government (I asked a local there to translate) before the police brought them down, in an ordeal which lasted a cool half an hour. I fought the law & the law won. The open dissent wasn’t a surprise to me since the adjacent Taksim Gezi Park was the site of major protests a few months earlier in June 2013 when news got out that there were plans to redevelop the park into luxury apartments and retail spaces. The nationwide mass protests led to the cancellation of the development and the preservation of the park. 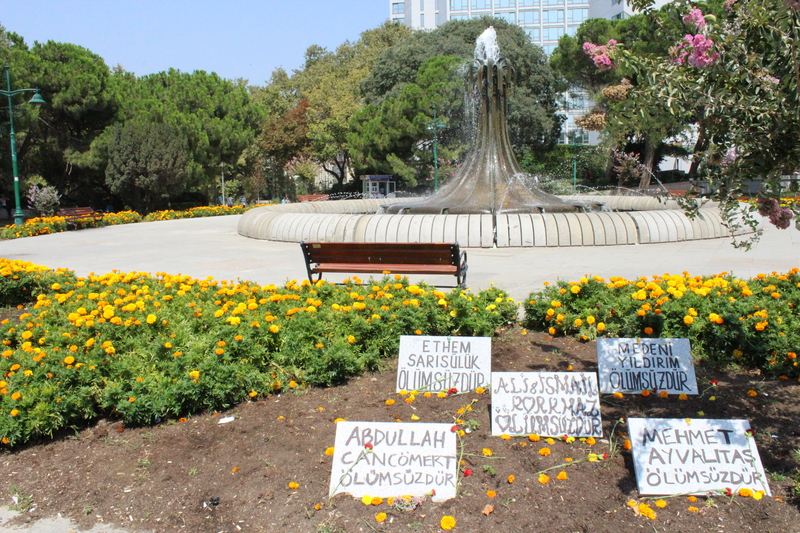 I didn’t see any signs of destruction at the park as if the demonstrations did not happen but I did chanced upon a small memorial remembering the activists who lost their lives in the Occupy Taksim movement. Tribute to the fallen Taksim Gezi Park protestors. “Independence Avenue” reminded me of Chicago’s Magnificent Mile or Melbourne’s Bourke Street when it comes to glitz. It is a pedestrian street mall filled with every retail and entertainment outlet, including your McDonald’s and Starbucks’ but the wealth of architecture from Neo-Classical to Art Nouveau on display on both sides of the avenue made it palatable to my eyes. I could imagine how pretty Istiklal Caddesi would look at night when street lamps lining the whole length of the avenue are complemented by the colorful displays of each store. 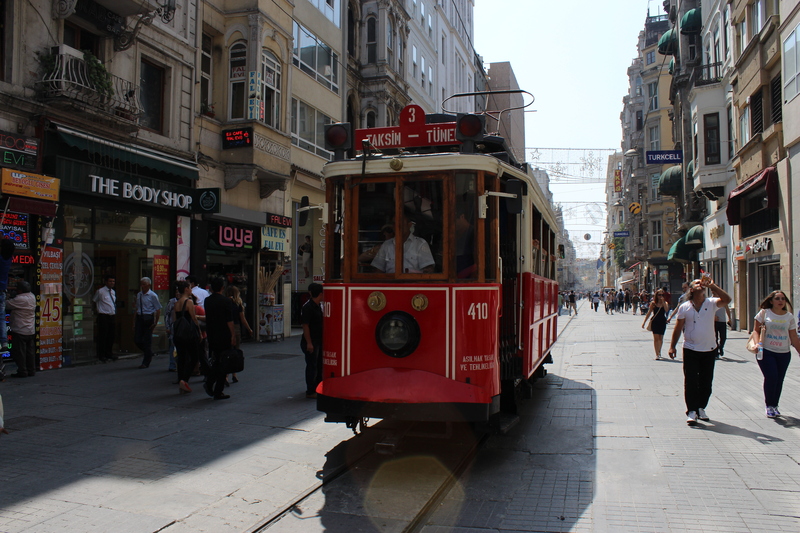 Skip the tram and admire the shops and architecture of Istiklal Caddesi. 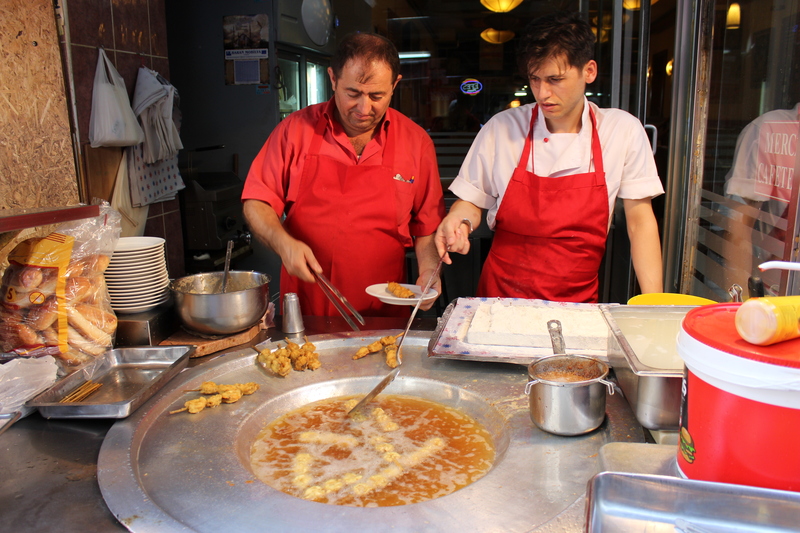 The Lonely Planet travel guide recommended me to stop by Balik Pazari (“Fish Market”), a part of Istiklal Caddesi, to try a street delicacy: Midye Tava, deep-fried mussels on skewer dipped with a garlic pine-nut sauce. This artery-clogging dish was easy to find as most of the restaurants serve it by the street side. There’s not much to explain when it comes to deep-frying food but thumbs up to the sauce that complements really well with the batter-covered mussels. How to make mussels tastier? Deep-fry ’em. A quick detour off Istiklal Caddesi took me to the Sufi Mevlevi Lodge in what is to be my first hand experience with the Sufis. Sufism is a mystical branch of Islam believing that their oneness to Allah SWT is the purest original form of Islam, and the one here is run by a sect called the Mevlevi Order. The lodge is a simple white-washed wooden house hosting a collection of artifacts depicting Sufi culture – their musical instruments, clothes and wardrobe, manuscripts and their daily routine. 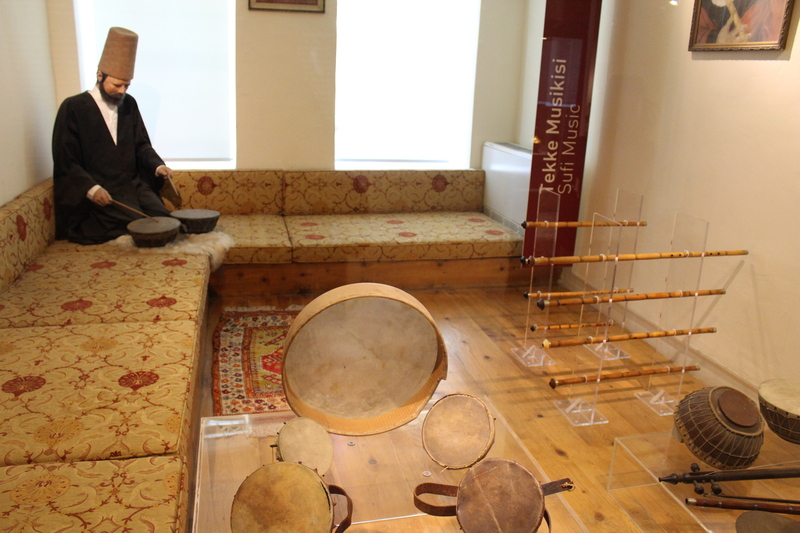 Musical instruments used by the Sufis. I was eager to learn more about the Mevlevi Order who are known for their Whirling Dervishes. The dervishes would recite zikir, short prayers said repeatedly, while entering into a state of trance by whirling themselves in a circle. This was apparent when I entered the ceremonial hall connected to the lodge – the hall war circular and beautifully decorated with iron-wrought frames and scriptures from the Quran. The dervishes still perform at the lodge but only as an attraction and not a real ceremony. 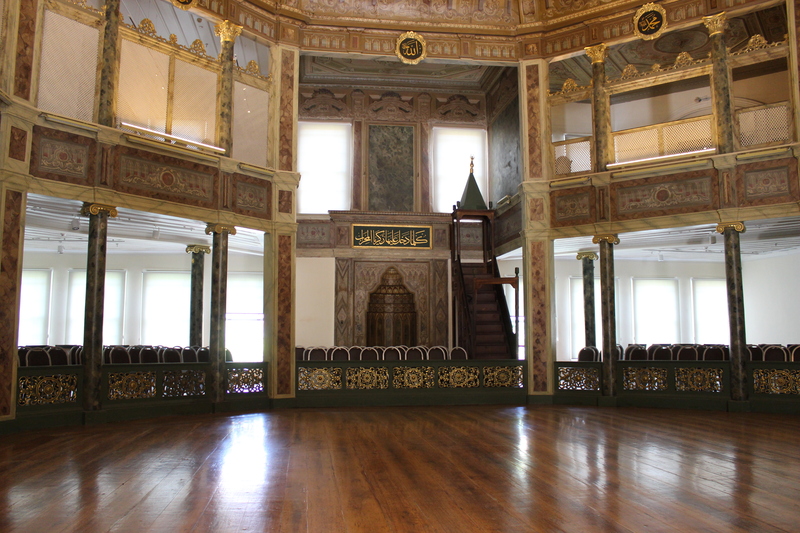 The hall where the Whirling Dervishes conduct their ceremonies. 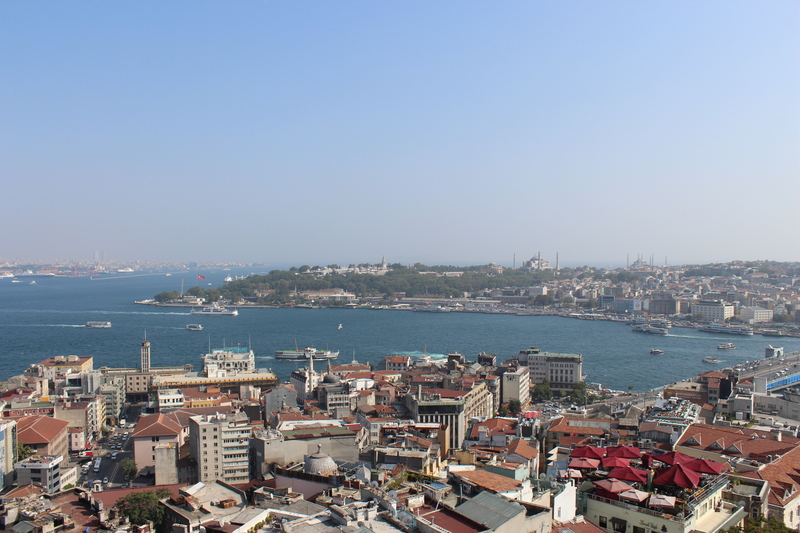 My final stop in what seemed to be a long day was climbing (via an elevator) up the Galata Tower. 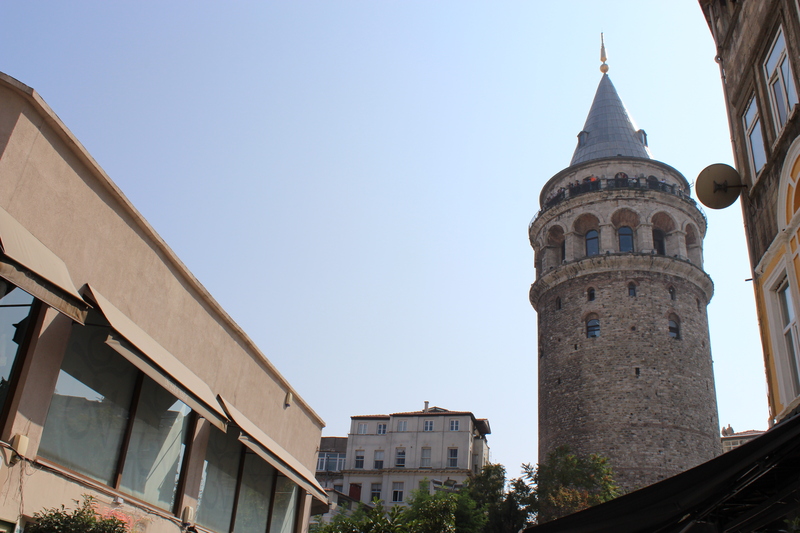 This stone tower marks the end of Istiklal Caddesi and the start of the Galata neighborhood. This cylindrical structure was originally named Tower of Christ after the Genoese of Constantinople built it in 1348. The tower’s non-conforming shape compared to the surrounding buildings made it easy to spot from across the river, making it an iconic landmark on the other side of the Golden Horn. An iconic landmark of the Galata quarters. The line was quite long as I took 30 minutes to finally get on the elevator. At the top, I had to climb two flights of stairs to get on the two-tier observation deck of the tower to a view that I can simply describe as breathtaking. The tower looked to be not that high but I somehow caught a 360 bird’s eye view of the metropolis. You could really feel that you’re at a highpoint of the continental divide, a place so majestic many major powers covet it over the centuries, through peace and war. I was quite amazed at myself for covering that much of an area on my first day in Istanbul. At the end of the day, I was too tired to walk and slept as early as 8:30 pm after another hearty meal of lamb and rice. The Beyoglu and Galata neighborhoods are comparably new since I spotted shiny new skyscrapers north of Taksim Square, as compared to the old quarters (we’re talking about centuries old) which will be the subject of my next blog post. Woah so many history in Istanbul! And also those artery clogging food also sound amazing haha.